Managing Oneself is a short book written by Peter Drucker in 1999 and published by Harvard Business Review. 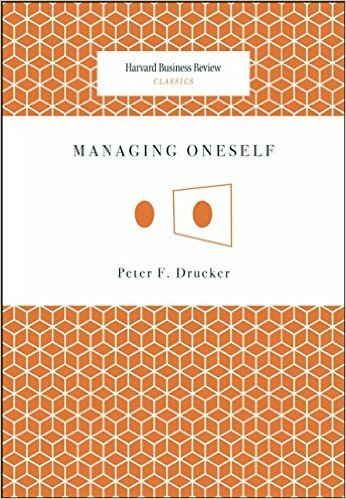 Drucker says in this book that today, in a society where most of us are knowledge workers and will have a useful working life of about 50 years, it is essential to learn to manage ourselves. Only then will we be able to place ourselves where our contribution is most valued at all times. This article is a summary of this book, a classic of the so-called father of modern management. I hope it makes you think and you find it useful. You cannot perform well in that in which you are weak, you need to perform according to your strengths. So, first you need to know what your strengths are and the only way to do that is by analyzing your own feedback. Whenever you make an important decision or perform a key action, you should write down what you expect to happen; a few months later you should compare the expected results with the actual ones. If you practice this method consistently, Drucker estimates that in two or three years you will be able to recognize what actions are helping or depriving to maximize your strengths, and in what contexts you are not particularly competent. You will also know what not to do. Not worth striving for improving those areas where you have no talent since you would become mediocre at best. Moving from incompetent to mediocre requires more effort than moving from good to excellent. The important thing is that you concentrate on your strengths and work to improve them even more. You must discover the small gaps in your strengths, probably hidden by excessive intellectual arrogance, and put the means to acquire the skills and knowledge needed to cover them. Feedback analysis will also show you some bad habits that make you an ineffective worker and must be eradicated. You can even detect if you have a behavior problem that hinders your communication with others. Manners, little details like saying “please” or “thank you”, allow two people to work together whether they like each other or not. There are very bright people that don’t understand that. Very few people think about how they get things done. This is a unique feature in each and much depends on our personality. We can slightly modify our way of performing, but it is complicated and unlikely to change completely. Just as you get better results if you work at what you’re good, you also achieve better results if you work in the way you best perform. During World War II, Dwight Eisenhower, Supreme Commander of the Allied Forces, managed press conferences as anyone, describing any situation or decision with great skill. However, ten years later, when he was president, his speech was awkward, erratic and often incoherent. The problem is that Eisenhower didn’t know he was a reader, not a listener. When he was commander, the questions of the press were presented in writing before the conference was to begin. When he was president, press conferences were open and he was not even able to listen carefully to the questions in order to give the best answer. It is difficult for a reader to become a good listener and vice versa. Trying to be what you are not will hamper your job. How do you learn? Very bright people, like Winston Churchill, did horrible in school. The reason is that we each have a way of learning and sometimes it does not match the usual teaching methods, which are basically listening and reading. Some people learn by writing, others by taking notes, others by hearing themselves talk and others by doing. Being aware of how you learn is very important to acquire the necessary knowledge effectively. You must use the method that works for you. Do you work more comfortable alone or in a team? If you prefer to work with more people, in what kind of relationship? Some work best as subordinates, others as team members, others alone, and others as coaches or mentors. Are you better taking decisions or advising others? It often happens that people who give exceptional advice is unable to make decisions under pressure. Moreover, some people need someone to push them to make decisions. Other questions to ask yourself: Do you work well under pressure or need a predictable environment? Do you prefer working for a large company or for a small business? The idea is to not try to change yourself but to know yourself to be stronger where you already are strong, and not devote yourself to do things where you are going to perform poorly. Put it another way, what is the kind of person you want to see in the mirror every morning? Working for an organization whose values are incompatible with yours will only generate frustration and poor performance. This is not only an ethical issue. A company which focuses more on short-term results than in long-term results can also be a question of values. Each company determines its priorities and these may conflict with your way of seeing things. Although a few people know where they belong when they are kids, most people do not know it exactly until they are past their mid-twenties. Once you know what your strengths are, how you perform and what your values are, you are in a position to decide where you belong. Or at least you should be able to decide where you do not belong. At this point you should be able to say no to any proposal that does not fit with you. And as you know yourself enough, you should also be able to accept an appropriate proposal, warning of your peculiarities. Traditionally, we have always expected to be told what to do. This way of working is over. A knowledge worker must analyze the situation and decide what should contribute according to his strengths, values and way of performing, in order to achieve the desired results and make a difference. Most people, whether they work for a company or independently, relate to others and need to be effective working with them. You have to accept responsibility for your relationships, which means two things. First, you have to accept that other people are individuals like you, with their strengths, values and ways of getting things done. To be effective, you have to know these facets of your coworkers. It is your obligation to observe them and find out, whether you like them or not, because today’s organizations operate from trust and understanding between people. Second, you must take responsibility to communicate with them. Asking is still the best way to understand and meet another and yet many people don’t do it because they are afraid of being thought annoying or foolish. Working for one company the whole life is over. Your working life is longer than most organizations’ life, and also nobody holds many years doing the same thing without getting bored. A knowledge worker is versatile and can switch from one place to another without problems. Therefore, self management is a crucial skill today. You are the CEO of yourself. A good summary of a good book. The "self audit" is a difficult one to do, as the ego and fear sometimes gets in the way of being objective. None of us would like to think we don't work well with others or use our time correctly. It is often only when we crash and burn we take the time to review our surroundings to determine who we are, how we got here, and most importantly, where we want to go. I am a big fan of the 360 Reviews, where peers provide feedback that helps in the process of self-assessment. It is good to set goals and even better to be honest with ourselves, but without honest feedback, we cannot hope to remain objective, let alone clearly focused. This is especially true for knowledge workers. I am fond of telling people "I don't know what I don't know". It is all too easy to get our heads stuck in the sand and focus on specific areas, which might be good in the short term, but detrimental to our continued growth and success in the long run. Knowledge works must continually grow, be challenged, and seek out more than what they already understand. They are, in essence, students. I've worked for multiple companies and have freelanced, as well. One thing remains constant: you are your own best coach and enemy. If we don't stand up for ourselves, determine our own vision, work towards our goals, and maintain our own sense of where we belong, we'll get lost in the mess that is the corporate jungle.